The Bentley Bentayga Hybrid will be the British automaker’s first electrified model featuring a plug-in hybrid powertrain that combines a turbocharged 3.0-liter V-6 and an electric motor. It can travel up to 31 miles in EV mode, based on the NEDC testing standard, and can get to a full charge from empty in 2.5 hours using a level 2 charger or 7.5 hours when plugged into a level 1 charger or a household outlet. The plug-in hybrid powertrain allows drivers to manage battery use while on the road. The Bentley Bentayga Hybrid features a unique multimedia system that provides powertrain details, allowing the driver to monitor the battery’s charge and see the vehicle’s current distribution of power. Navigation information is also used to maximize the hybrid powertrain efficiency on your route by engaging the ideal E mode for the conditions. A total of three E modes have been added, including EV Drive, Hybrid, and Hold modes, in addition to the four on-road settings, which are Sport, Bentley, Comfort, and Custom. Total system output for the hybrid powertrain hasn’t been announced yet. The Bentayga Hybrid gets a number of model-specific touches such as a unique gauge cluster with a dial that shows battery status in EV mode, which changes to a standard tachometer when the V-6 engine is active. The MyBentley3 telematics service shows battery charging status via a smartphone app in addition to vehicle status and remote heating and cooling functions. Additionally, the app will also come with a charging station locator that will also show you the closest charging stations via a smartphone app. The Bentley Bentayga Hybrid also comes with a cool home-installed recharging unit built by Philippe Starck. Available active driver assistance features on the Bentley Bentayga Hybrid include an adaptive cruise control system that uses navigation data, sensors, and camera to predict oncoming turns, boundaries, and speed limits. Other driver assistance features include an automatic parking system, traffic sign recognition, night vision, and a head-up display. 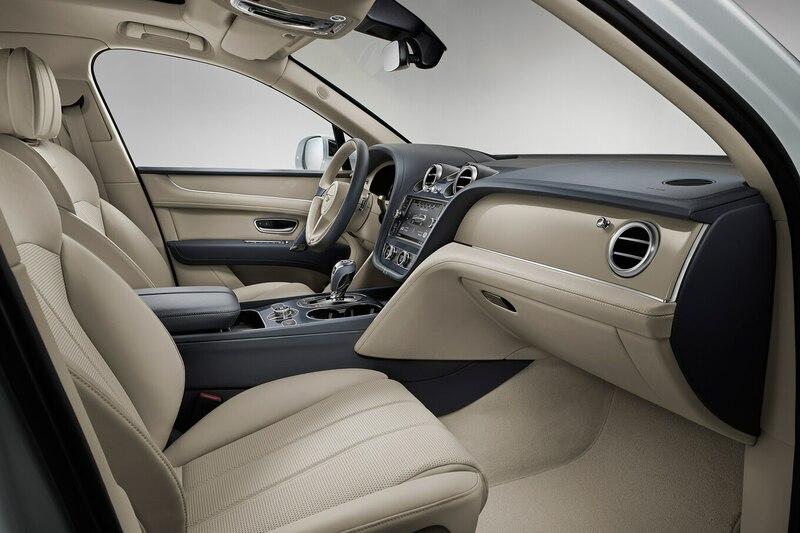 The infotainment system features an 8.0-inch touchscreen, a 60GB hard drive, and 30 languages to choose from. Other available features include a 10.2-inch tablet, an 18-speaker Naim audio system, 22-way power adjustable front seats, 18-way power adjustable rear seats, heated, ventilated, and massaging functions for front and rear passengers, and a large panoramic sunroof. In addition to the five-seat configuration, the Bentley Bentayga Hybrid will also be offered in a four-seat layout with two individual seats in back.